Hobby Farm > Animals > Fruit Pizza Cookies and a Trip to the Farm! 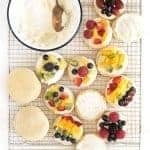 Festive fruit pizza sugar cookies are made with super soft sour cream sugar cookies and a simple cream cheese frosting, and then piled high with seasonal fruit. Today I’m working with Organic Valley, and I have so much to share with you! 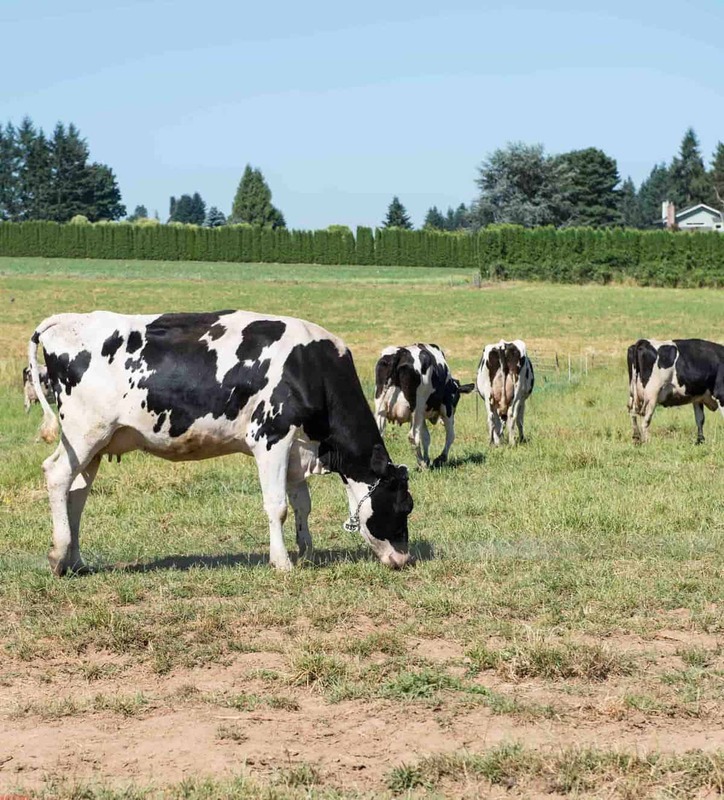 This post shares my experience visiting one of their organic dairy farms just outside of Portland, Oregon, as well as a recipe for delicious fruit pizza sugar cookies. I’m excited to share both of them with you today. I have to start by saying that the trip to Cloud-Cap Farms was a once-in-a-lifetime trip, and I’m so grateful that I had the opportunity to go. The cool thing is, the day I visited the farm it was open to the public, so anyone could come. Organic Valley products are something I’ve used and loved for awhile now, but I knew very little about Organic Valley’s origin story and mission before going. I’m excited to share more about this really unique company with you. 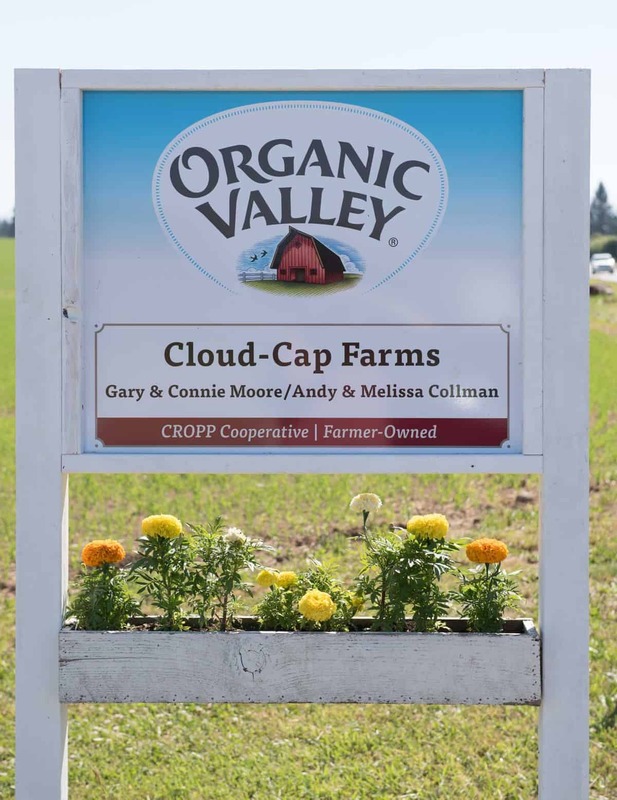 Organic Valley is a co-op, which means that the farms who supply the products that are sold are the owners of the business. Learn more about their impressive business model here. Organic Valley puts a huge emphasis on helping small family farms work (and be successful), and I love that. Being a small business owner in a rural community has changed my life; giving that opportunity to others is a gift I think is worth sharing. They have a farmer-funded grant program that supports organic research, education, and advocacy projects across the country. Is organic really better for you? I think it is, and that’s why I choose to grow and produce as much of my own food as I can. That being said, I can’t produce everything I need, and I bet you are in the same boat. It was so refreshing to go and see a successful farm that cares about the health of the land and animals while still turning a profit. These folks are smart and informed, and they are making mindful decisions. You can read more about what organic is and why it is important here. 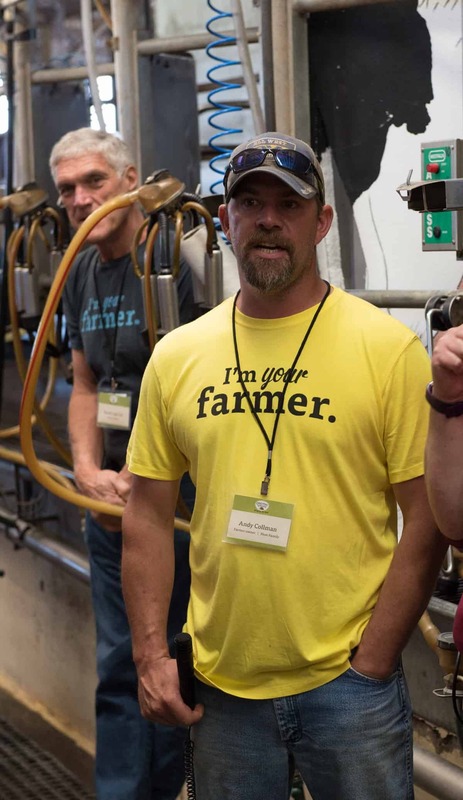 Organic Valley had a pretty cool start, just a group of farmers in the Midwest who were told to “get big or get out,” and they didn’t want to. You can read about their humble start here. Friends, I feel like this trip lit a fire under me, in a good way! I’ve always had a passion for good food. 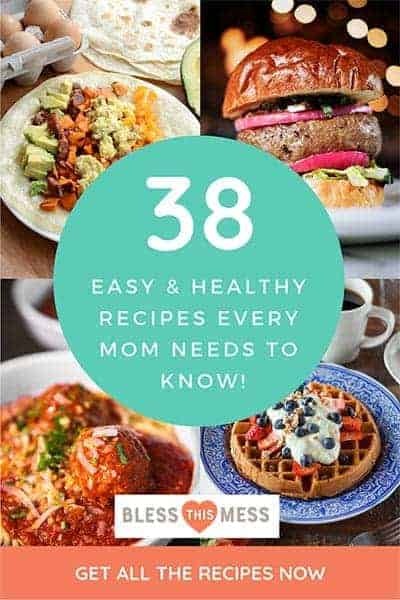 I know how important it is to feed my family well (and I try to share my best tips, tricks, and recipes here so that you can feed your family well, too). Once in a while, though, I feel really discouraged with the food systems in the United States. I feel like if I don’t take charge and make/grow/raise/produce/bottle it myself, then my family shouldn’t be eating it. Organic Valley has literally renewed my hope in the future of American food production; it’s a company I’m truly proud to support. Going out to the farm and meeting employees, farmers, and even cows was inspiring. At the event they had all kinds of stations set up with people explaining how things worked. I visited the milking parlor (they have a “cow shower” that is essentially little sprinklers on the floor that wash the cows as they walk in, such a fun idea! ), the barn (where the cows can come in from the pasture to enjoy other free-choice foods and some shade on warm afternoons), the calves (so cute), the tents set up with samples of Organic Valley products (their grass-fed cheese is amazing), the shake-and-make-your-own-butter stations, and the station for learning about pastures. They also served an organic lunch (I’m moving to the PNW just for the berries). The guys in the picture above were at the pasture station, and it was one of my favorites. I learned SO much and I have big dreams of properly grazing our own land in the future. Steve Pierson, on the left, owns an organic dairy farm a few hours away and is part of the Organic Valley co-op. He and the owners of Cloud-Cap transitioned to organic farming from commercial in the mid 2000’s, so they had some great insight because they know both commercial and organic farming. 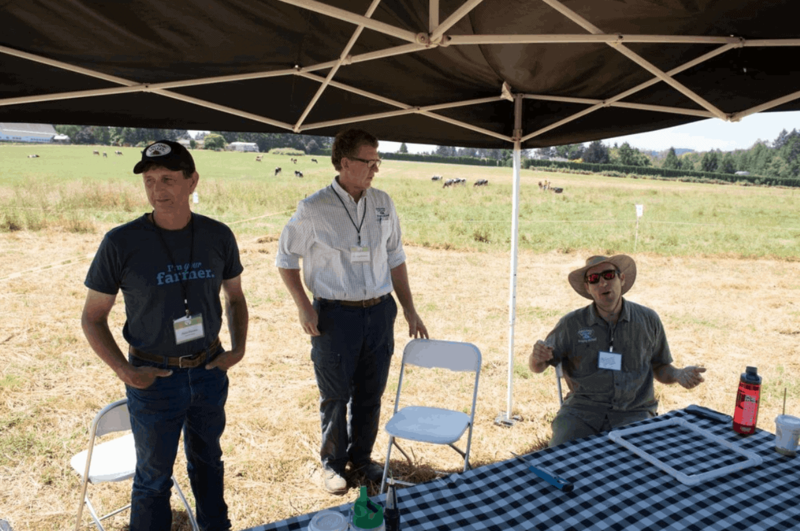 Dr. Greg Brikner (center) is a veterinarian that travels throughout the country visiting Organic Valley’s 2000+ farms and helping farmers troubleshoot issues and checking on animals. Jake Shmitz, right, visits farms he thinks might be a good fit for Organic Valley and tells them about the co-op (that sounds like a fun job if you ask me). Steve was so much fun to listen to, I actually sent him an email when I got home to get some more information. These men talked a lot about pasture health and how it relates to the health of the animals. They talked about organic farming as an interesting cycle: the grass, gut health of the cow, and the healthy micro-organisms that go back to the grass via the cow manure. They also talked about the health benefits of organic milk (because the animals have good gut health and have less stress), plus other exciting things like how much they have benefited from moving from commercial to the Organic Valley co-op. I might write a whole other post about how neat and sustainable organic dairy is. 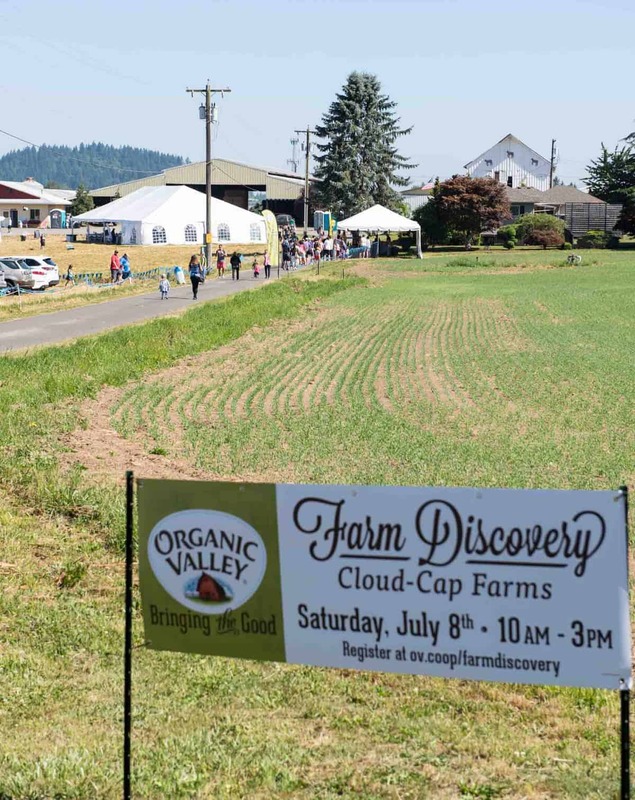 The cool thing about this farm discovery day is that YOU can go to one, too. They are happening at Organic Valley farms all over the country. Check out more info here to see if there is a farm tour near you. I’d highly recommend taking the whole family for a day at the farm – you’ll love it as much as I did. Heck, I’m thinking about planning next summer’s vacation around a farm tour because I had such a great time! Cloud-Cap Farms is a 5th generation dairy farm. Andy and Melissa Collman run the farm with Melissa’s parents, Gary and Connie Moore (Andy is pictured above). I got to interview Melissa, and she was so much fun to talk to. She’s a smart business owner who knows a thing or two about raising dairy cows; you can see our live interview here and follow Organic Valley on Facebook here. 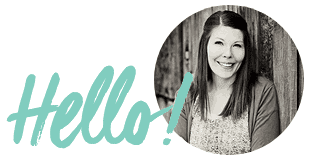 We talked all things dairy farming, our favorite Organic Valley products, what we like to cook (spoiler alert: Melissa likes to make pie! ), and more. If you have a minute, definitely take a look. 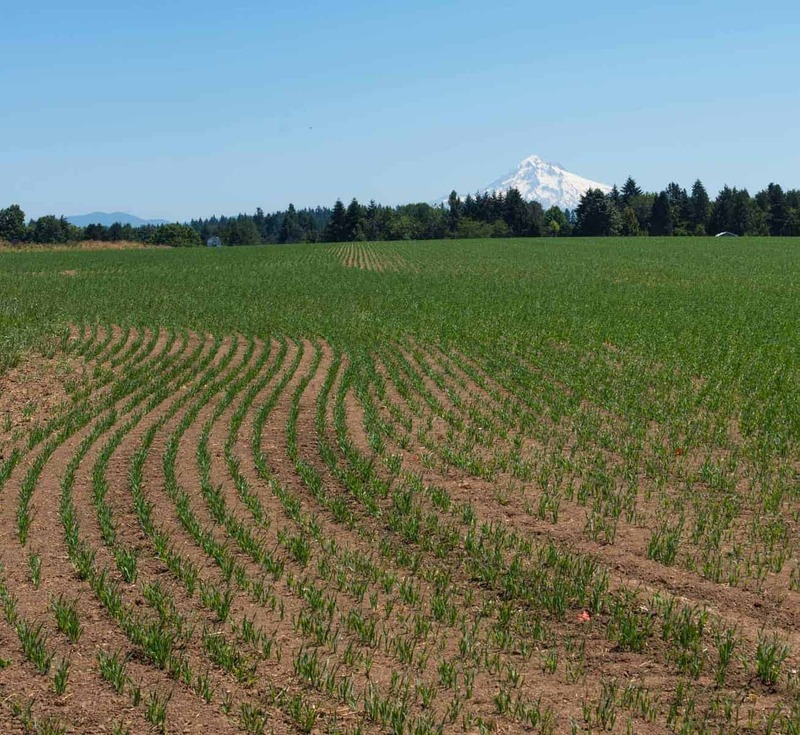 Here’s a picture of on of their fields with Mount Hood in the background. Gorgeous! In conjunction with an organic dairy farm visit, I thought my famous fruit pizza cookies recipe would be a fun one for you today. 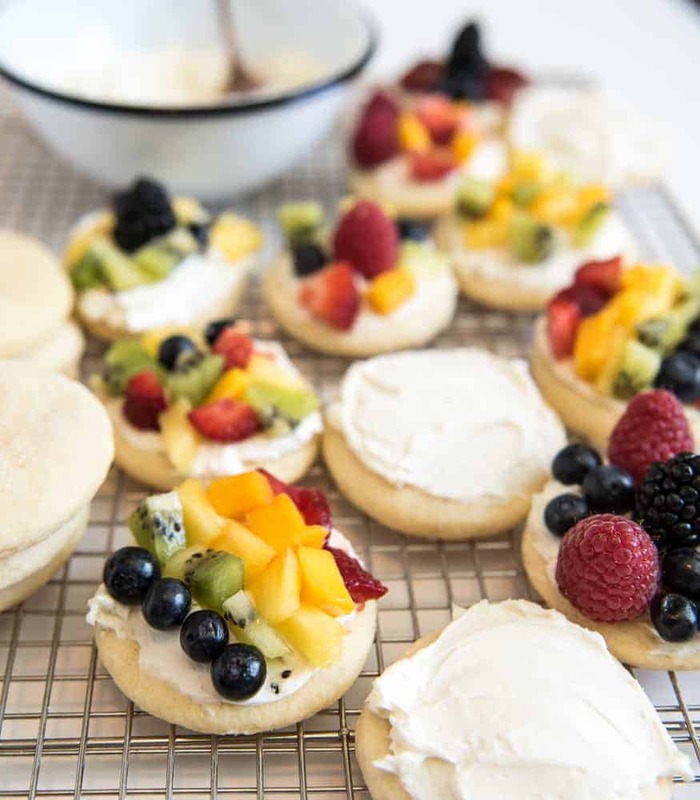 My family loves fruit pizza sugar cookies because they are extra light, fluffy, and soft, but they also keep their shape well. 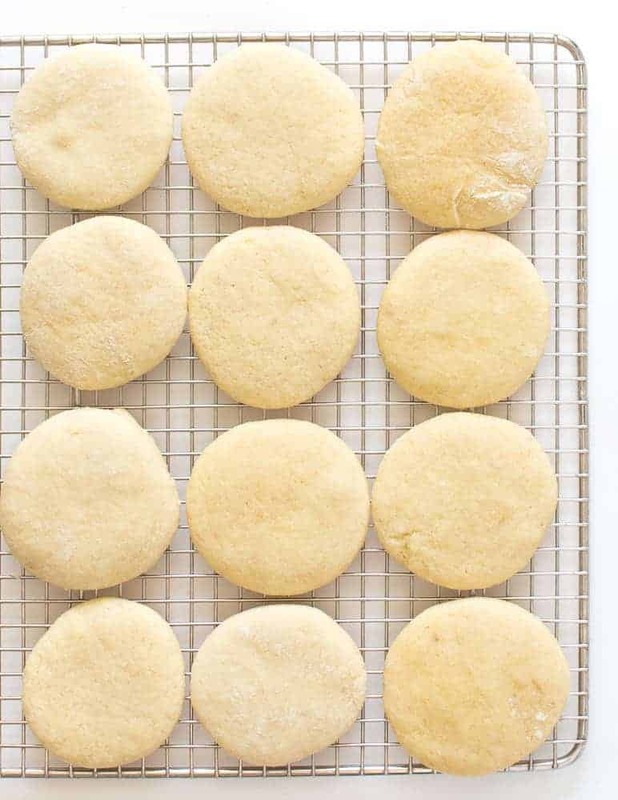 A good sugar cookie recipe is always nice to have on hand for holidays and weekend treats. Enjoy these with a glass of Organic Valley milk, and you’ll really be in cookie heaven. You can’t skip chilling the dough. This is a must-do to get the cookies to roll out well and keep their shape. The great part is that you can chill them for 4 to 36 hours. It’s super easy to get these cookies to work with your schedule. The secret to their super soft texture is Organic Valley sour cream. Don’t use reduced fat or fat-free products here, though – full fat is best. You can use just about any fruit that you’d like on top. Strawberries and cherries in the spring, berries all summer long, and orange segments and pomegranate bits in the winter. Use what you like and what is in season. Festive fruit pizza cookies are made with super soft sour cream sugar cookies and a simple cream cheese frosting, and then piled high with seasonal fruit. In a large bowl, cream the butter and sugar together until light and fluffy, about 3 minutes. You can use a stand mixer, an electric hand mixer, or a fork and some elbow grease to do this. It’s up to you. Add the sour cream and stir until combined. Add the flour, baking powder, baking soda, and salt and stir until well-combined. The dough will be sticky. When you are ready to bake the dough, remove it from the fridge, unwrap, and divide it into 2 pieces. Roll the dough out to 1/2 inch thick on a well-floured surface and cut into shapes (I used a 3-inch circle cookie cutter). Place the cut out cookies on a parchment- or baking-mat-lined cookie sheet and bake at 350 degrees for 10-11 minutes. The tops of the cookies will be light, but the bottom should be lightly brown. To make the frosting, add the butter, cream cheese, vanilla, 1 tablespoon of cream, and the dash of salt to a large bowl and beat until fluffy, about a minute (a stand or hand mixer works well for this). Add the powdered sugar and beat until smooth and fluffy. If the frosting is too thick, add the additional tablespoon of cream or milk and beat again. 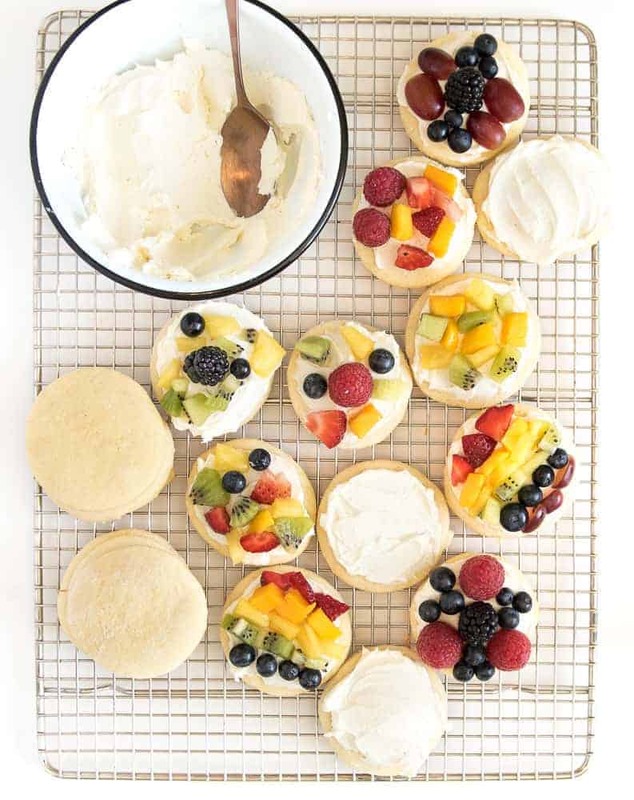 When the cookies are completely cooled, add a generous helping of frosting and top with seasonal fruit that has been cut into bite-sized pieces. So delicious! I can’t wait for you to make a batch of these. Thank you for enjoying a recap of my trip to Organic Valley and Cloud-Cap Farms, and these fun and simple fruit pizza cookies. It was a pleasure to write about them both. Organic Valley is really fun to follow on Instagram if you are interested in cute animal/farm pictures, FYI. This is a sponsored post written by me on behalf of Organic Valley. Thank you for supporting the brands that I truly love and that help make Bless this Mess possible. The opinions and text are all mine. I loved the interview you did on Facebook. I’m looking for the products near me! You’ll love whatever you do find! That interview was so fun! I love that the cows came over to see you. I wish there was a farm to visit near me! I’m so glad you got to watch it! These cookies alone sound spectacular….but adding the fruit and frosting make them unforgettable!!! Thank you Liz, we love this recipe! Oh wow, these are adorable ~ healthy with a touch of yum thrown in…and Organic Valley is THE BEST! Thank you Sue. I’m a huge fan of your cooking and it’s so exciting to have you comment.